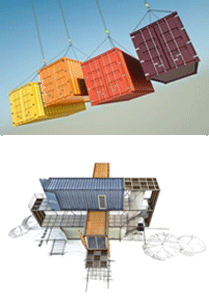 A cool and comfy home office, workshop, studio and other stand-alone structures can find the perfect home in an insulated shipping container. Insulated shipping containers differ from their standard cargo container cousins by having an interior lined with insulation. While the insulation may make the interior dimensions a tad smaller than standard containers, the reduction in size can be worth the temperature control built right into your environment. The shipping industry changed dramatically in 1956 when American trucker Malcolm McLean introduced the first intermodal shipping containers to the world. 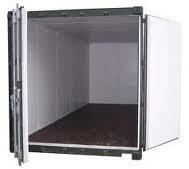 And it changed even more when the first insulated shipping containers hit the market. While it’s tough to pin down an exact date when these containers first came into play, they dramatically increased the type of cargo that could be shipped for longer distances. Insulated sea containers provide thermal shipping solutions, with a ready-made, temperature-controlled environment where items can retain cooler temperatures for extended periods. 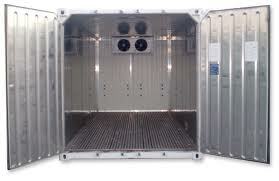 Although the interior of the containers is insulated, they are not equipped with refrigeration units or other cooling components. You can think of them as a very large, insulated cooler that helps to retain the starting temperature of whatever cargo you place inside. A couple of additional comparisons are thermal food containers or insulated lunch boxes, but the containers are on a much larger scale. Insulated cargo containers come in the same standard sizes you find with other shipping containers, with the 20-foot and 40-foot lengths being the most common. They measure 8-feet, 6-inches high and 8-feet wide, typically with a double-door opening on one end that is approximately 7 feet, 4 inches high and 7 feet wide. 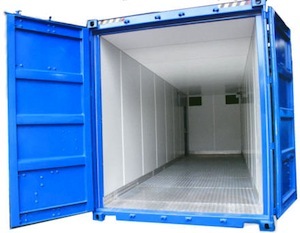 The interior dimensions of insulated cargo containers are close to those of non-insulated containers, although the layer of insulation will slightly reduce the interior size. As mentioned, insulated ISO containers provide thermal shipping solutions for items that need moderate temperature control during shipping. Commercial uses include transporting frozen or chilled foods and goods, along with pharmaceuticals and other materials or products that are sensitive to temperature. You can also find insulated containers used as storage units to provide a layer of protection against extreme exterior temperatures. If you’re using an insulated container for buildings or housing purposes, it’s imperative to use it alone and unconnected to other structures. Knocking down a wall or leaving the ceiling open defeats the purpose of the insulation, which will only benefit you if the entire container is enclosed as originally built. Home offices are a popular choice for these containers, providing a stand-alone office that is fully self-contained away from the main house. Artist studios, workshops, storage sheds for delicate items, large playhouses or small guest houses are other ideal uses for insulated storage containers. For rural properties, they can make excellent detached pantries for food items that do not require outright refrigeration but do need some degree of temperature regulation. These containers also make for excellent getaways outside the home. The size and insulation make them a fitting choice for a cozy vacation home, cabin or hunting lodge, all with the option of moving them to different locations as needed. You can increase comfort levels by installing a window air conditioning unit through a customized opening in one of the walls. Heating can be provided by a small space heater during colder weather.